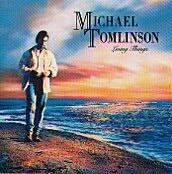 Living Things is Michael Tomlinson's 4th release - and with yet another national record label offering international distribution. Though there were many recognizable aspects of the by-now familiar style of writing and singing, this album took on a more powerful feel, particularly in Angelenos and I Might Be Dreaming, because of the excellent co-production of Dan Dean, well known bassist and Seattle producer. Dan brought in a number of nationally known players, Howard Roberts and Ernie Watts among them, to add a flavor of expertise and savvy to Michael's songs. The title tune has continued to be one of Michael's most requested concert songs and several others, For Old Times and I Knew You Well and are timeless in their appeal.